Need to replace your Medical Tag for our Medical ID Sport Straps/bands? Well, here you go! *No further discounts on this laser engraved item. Engrave medical information on Front and back of Tag. 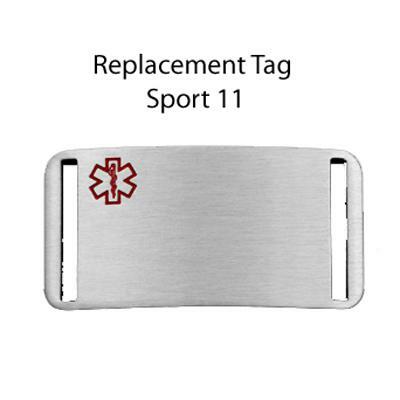 Medical ID Tag is made of 316L Surgical Stainless Steel. Features black lasered engraving. Engraving is lasered onto the metal in black letters using a block style font. Laser highly recommended for active children or adults. We will engrave SEE OTHER SIDE on the front of this medical id tag. Please enter engraving in UPPERCASE letters & be sure to leave space between words for clarity. Thank you!